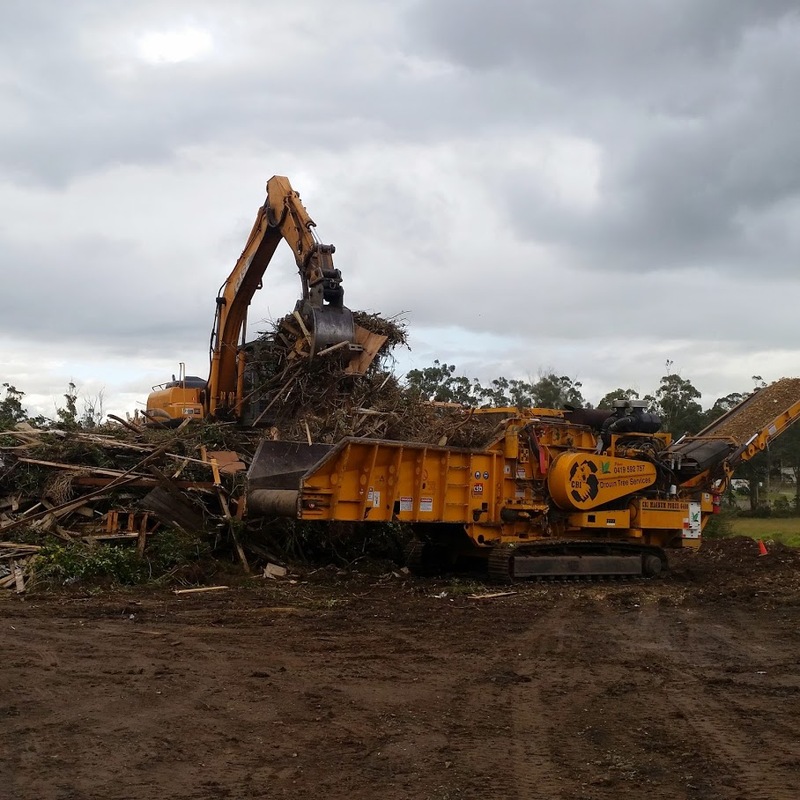 Drouin Tree Services include land clearing, residential tree pruning, tree lopping, stump grinding, arborist reports and consulting throughout the Gippsland and Western Port, Port Phillip areas. Our aim is to give you (our clients) the best price, service and quality to retain your custom and build our business over the long term. 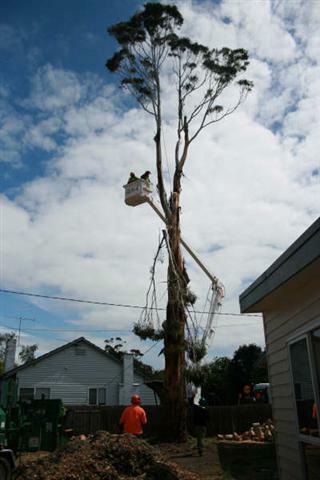 Drouin Tree Services have the experience and knowledge to show you the right way to go about any tree work. Confined removals require excellent climbing, rigging and cutting skills. In the first picture you can see the arborist climbing out and securing a large diameter lowering rope to the limb that he will be cutting off. 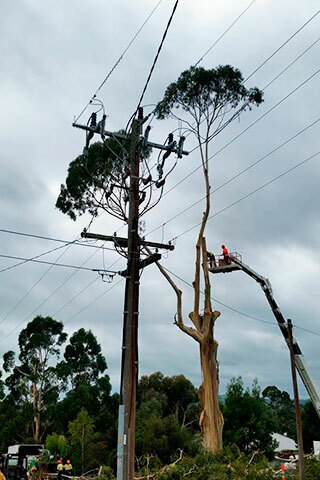 Smaller pieces of the tree are lowered in a controlled fashion to avoid damage to structures and other vegetation beneath. Prior to this an accurate assessment must be made pertaining to the trees stability and strength. If there's advanced decay or cracks and splits that are questionable then an elevated work platform (EWP), crane or combination of both may have to be used. The safety of your property and all people is paramount, we are experienced to make the right decisions and use appropriate work methods to do the job both quickly and safely. Specialist in big tree removal, pines, cypresses, eucalypts etc. 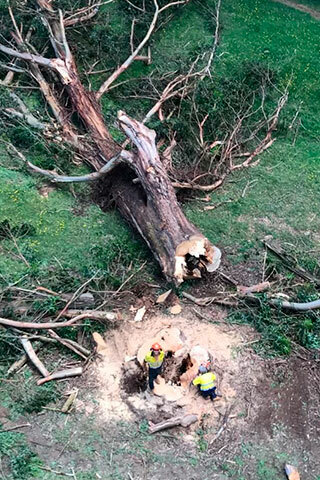 Our experienced tree crew can safely cut down these large trees and in numerous cases we use an excavator. 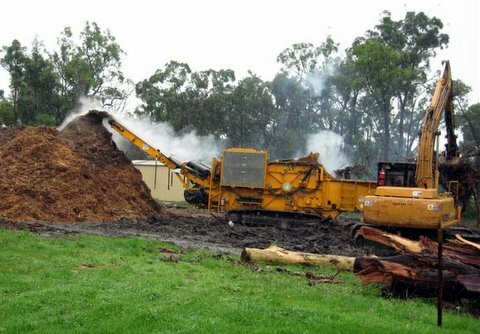 The advantage of dealing with us and local knowledge is we can reduce costs by obtaining heap and burn permits. Large wood and foliage can then be burnt off rather than chipped and hauled, the excavator loads the heap and moves the big wood around. 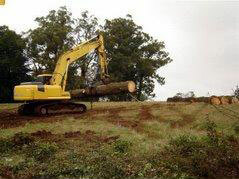 Where there is sufficient room the trees will be directionally felled. 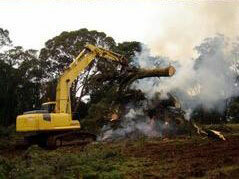 The excavator can push the tree, sometimes trees are also roped and a combination of the two are used. In the event of there being insufficient space to fell the tree a climbing arborist will dismantle the tree in pieces. We'll cover this aspect in the next section of hazardous and confined removals. 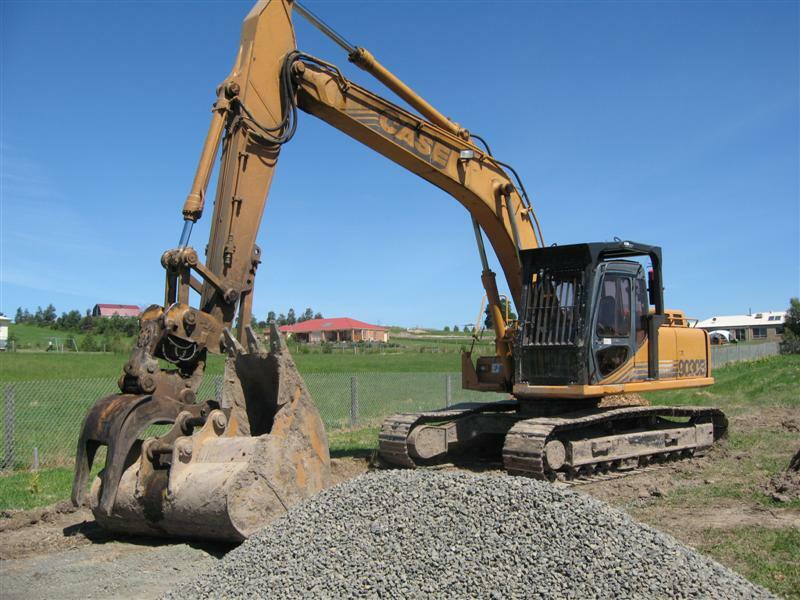 We also have a 21 ton excavator for hire. This can be separate from tree work so if you need a site cut, drain cleared etc do consider us. Excavator equipped with certified cabin guard ROPS/FOPS. 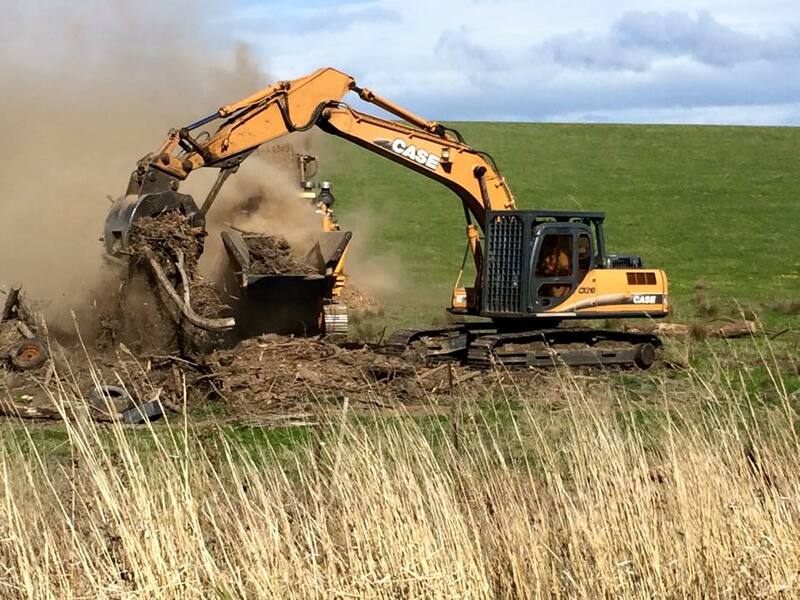 For more information, visit the excavator hire page. 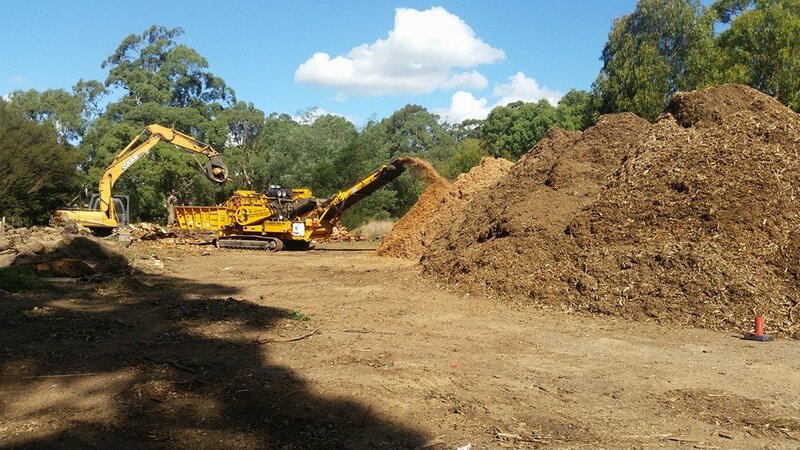 From an urban yard to a forest we can handle your job. 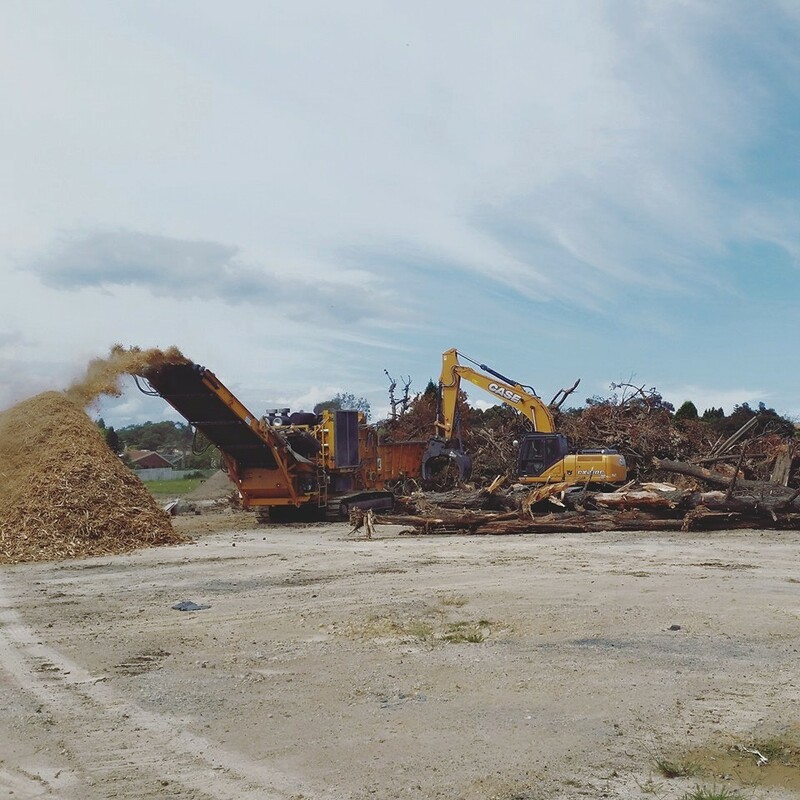 It is not unusual for us to clear hectares of trees including stumps and the debris can be mulched with the horizontal grinder where burning and conventional chipping is impractical or not possible. Horizontal grinder hire for tree and vegetation,landclearing jobs and mulching at transfer stations.